Still a reliable workhorse, the 2019 GMC Yukon arrives basically unchanged from last year. 2019 Chevrolet Tahoe vs. 2019 GMC Yukon: What's the Difference? These full-size SUVs have a lot in common. The 2017 GMC Yukon makes a good impression -- its well-made interior truly is top notch -- but it is ultimately an imperfect choice. 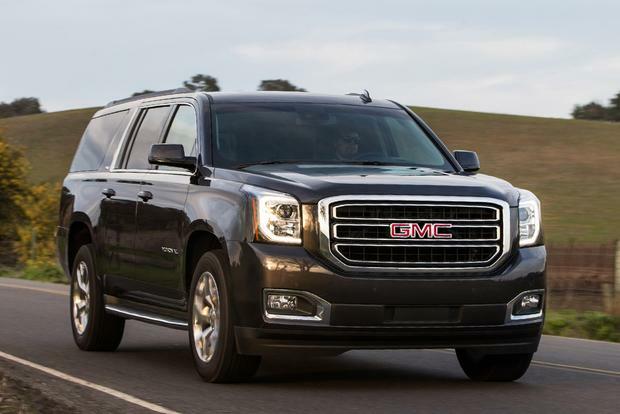 Despite the numerous choices in the expanding midsize-crossover-SUV field, there will always be strong demand for a full-size vehicle such as the 2016 GMC Yukon. For sheer passenger space (it can seat up to nine), cargo volume and towing ability, many Americans simply can't forgo what the Yukon and the stretched Yukon XL are serving up. These beasts don't easily fit into narrow, compact-car parking slots, and they aren't going to win any awards for sports-car-like handling or ease of maneuverability. However, as far as full-size SUVs go, GMC has perfected the formula better than anyone, creating a modern family caravan that is safe, comfortable and, unlike past station wagons, capable of tackling the worst winter weather. For those seeking luxury in their Professional Grade Yukon, GMC offers its Denali treatment on both the Yukon and Yukon XL. The Denali raises the Yukon's status a few steps above its Chevrolet Tahoe and Suburban cousins, stopping just shy of crossing into Cadillac Escalade territory. While the Chevy, GMC and Cadillac SUVs share the same platform, only the Denali shares the same engine and suspension as the Cadillac. 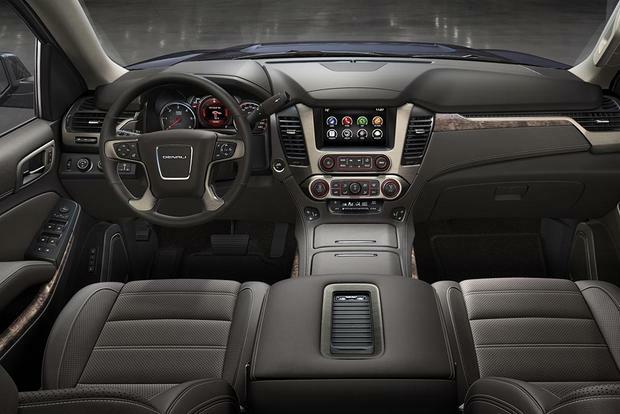 The big difference between the Chevy duo and the GMC Yukon is the latter delivers a more upscale interior in a vehicle that won't be viewed as elite when driving it on a road trip to go camping or fishing. The Yukon and Yukon XL see only minor changes for 2016 following a full redesign last year. Specifically, the SUVs add two major options, automatic high-beam assist and lane-keep assist, along with minor color changes and trim-level updates. 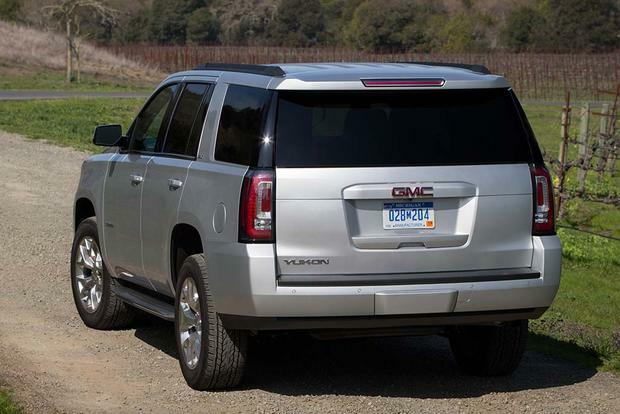 The standard engine for the GMC Yukon and Yukon XL is a 5.3-liter V8, good for 355 horsepower and 383 lb-ft of torque. Coupled to a 6-speed automatic transmission, this engine achieves 16 miles per gallon in the city and 23 mpg on the highway. Opt for the all-wheel-drive (AWD) version, and the mileage is nearly identical at 16 mpg city/22 mpg hwy. The pricier Denali trim is powered by a 6.2-liter V8, which produces 420 hp and 460 lb-ft of torque. The Environmental Protection Agency rates this engine at 15 mpg city/21 mpg hwy in 2-wheel-drive guise and 14 mpg city/21 mpg hwy when equipped with AWD. 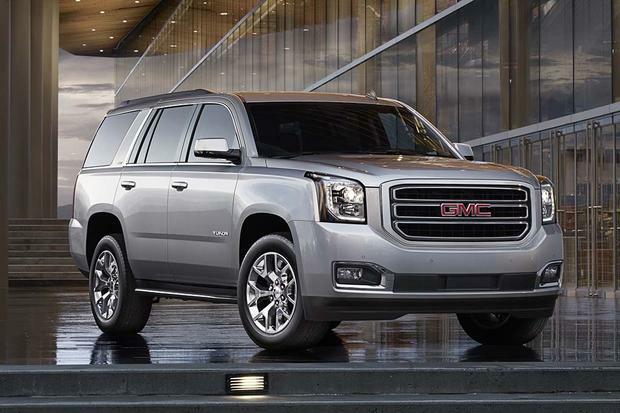 The 2016 GMC Yukon comes in three trim levels: SLE, SLT and Denali. Two body styles, the regular-length Yukon and the larger Yukon XL, are also offered. The Yukon SLE ($49,400 for the Yukon; $51,600 for the Yukon XL) features a 5.3-liter V8, 18-inch wheels, a rear-vision camera, rain-sensing wipers, front fog lights, a roof rack with cross bars, heated outside mirrors, Bose premium audio with five USB ports, front and rear park assist, a 110-volt power outlet, cloth seating, remote starting, a tilt-telescopic steering wheel and tri-zone automatic climate control. Front bucket seating can be replaced with a 40/20/40-split bench, increasing the overall passenger capacity from eight to nine people. Moving up to the Yukon SLT ($58,000 for the Yukon; $60,100 for the Yukon XL) adds leather seats, heated and cooled front seats, heated second-row seats, second- and third-row power-folding seats, a programmable power rear lift gate, a heated steering wheel, keyless entry and push-button starting, power adjustable pedals and the Driver Alert package that includes the Safety Alert Seat, side blind-zone alert, lane-keep assist, automatic high beams, rear cross-traffic alert and forward-collision alert with automatic braking. The premium Yukon Denali ($65,500 for the Yukon; $68,200 for the Yukon XL) brings a larger 6.2-liter V8, an 8-in color touchscreen radio with navigation and Bluetooth streaming, a 10-speaker Bose Centerpoint surround-sound system, active noise cancellation, Magnetic Ride Control and a power tilt-telescopic steering wheel. AWD adds about $3,000 to any Yukon or Yukon XL model. The SLE can be equipped with power adjustable pedals and a power rear lift gate (part of the Convenience package), as well as the Driver Alert package, a towing package and larger wheels and tires. The SLT offers the Sun, Entertainment and Destination package, bringing navigation, a rear-seat entertainment system, a power sunroof and an additional 9-month subscription to SiriusXM radio and NavTraffic. The SLT can also be equipped with adaptive cruise control. The Denali offers a Touring package with a head-up display, a power sunroof, a rear-seat entertainment package and 20-in chrome wheels. Adaptive cruise control is also optional on the Denali. The Yukon includes a full complement of airbags, including front-seat, side-impact and full-length side-curtain airbags. Also standard is the segment's only front-seat center-mounted airbag (on models with bucket seats only) that provides greater protection to the driver and passenger in the event of a side-impact collision. Additional safety options include parking sensors, adaptive cruise control, GM's Safety Alert Seat, lane-keep assist, forward-collision warning with automatic braking, rear cross-traffic alert and automatic high beams. The Yukon earned a 4-star overall score out of five possible stars in crash testing carried out by the federal government's National Highway Traffic Safety Administration. It has not yet been tested by the nonprofit Insurance Institute for Highway Safety. If you're holding your breath anticipating that we'll tell you the Yukon has precise handling and sporty moves, you should exhale now, because no such review is coming. Considering the Yukon's weight of 5,500 pounds, tall ride height and massive length, however, GMC has done a remarkable job getting its body-on-frame behemoth to behave. As long as the Yukon is not confined like a large bear in a small cage, it's able to comfortably run, negotiating winding roads, delivering acceptable levels of steering feedback and braking, and returning highway fuel economy numbers breaking the 20-mpg barrier. 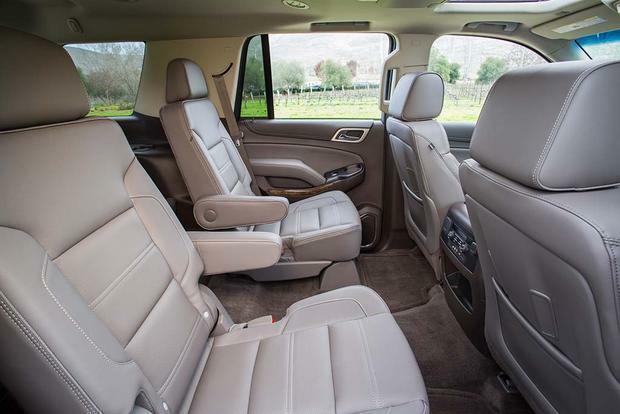 If you're all about performance and handling and you want the maximum squeezed from a full-size SUV, we recommend you go with the Denali trim. Its larger engine boasts more power and torque, yet its fuel economy only drops by one or two digits. The Denali's standard Magnetic Ride Control suspension (the same technology used in the Corvette) is what makes this Yukon the best-handling, best-riding of the bunch. Magnetic Ride Control can change the shock absorbers' dampening in milliseconds, responding to changing road conditions and helping keep the Yukon's ride stable and controlled at all times. An army of electronic assists, such as StabiliTrak stability control and electronic traction control, keeps the Yukon on its intended heading, while a number of features inside keep the driver alert. One of the more intriguing assists is an available Safety Alert Seat that vibrates on either side to warn of objects nearing the vehicle's side. As for high tech, the Yukon can be equipped with the MyLink infotainment system that includes a fantastic 8-in viewing screen with some of the most intuitive and user-friendly graphics. Unfortunately, some of MyLink's voice commands were not as user-friendly. For those who need to tow, the Yukon is rated up to 8,500 pounds with 2-wheel drive and 8,200 pounds with 4-wheel drive; Denali models are rated at 8,400 and 8,100 pounds, respectively. 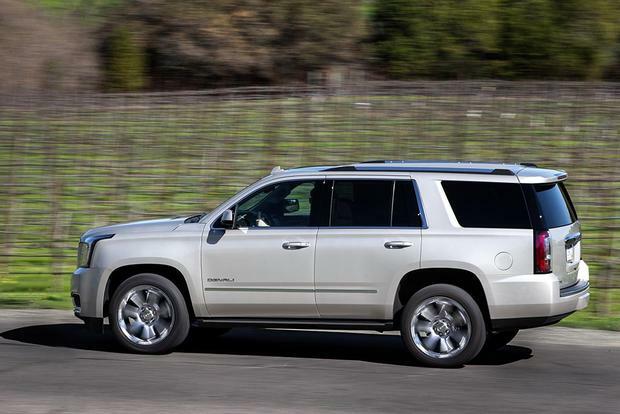 2016 Chevrolet Tahoe and Suburban -- The Chevrolet duo is mechanically identical to the Yukon and Yukon XL, with the Chevy models costing a bit less. Also, Magnetic Ride Control is standard on Chevy's LTZ trim, which costs less than the Denali. 2016 Ford Expedition -- The Expedition and Expedition EL can match the Yukon for size and interior room but have a better tow rating, a lower base price and a flush-folding rear seat for improved cargo room and easy loading. An aging design, however, can't match the Yukon's recently updated look. 2016 GMC Acadia -- The smaller GMC Acadia offers a more carlike ride than the Yukon and a lower price, but the Acadia doesn't have as much interior room, and it can't match the Yukon's tow ratings. Used Cadillac Escalade -- The Escalade touts more equipment, more standard power and more exuberant styling than the Yukon, along with a well-known brand name. Prices are steep, though, so you may want to consider a used model. To us, the clear choice is the SLT. 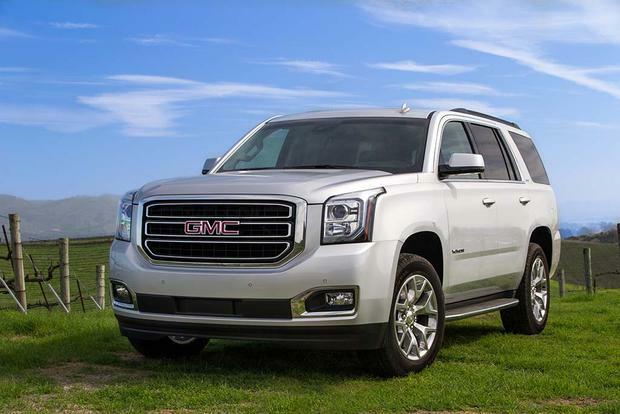 It offers all the upscale features buyers expect from a GMC while still holding the bottom line well below $60,000. If you need basic family transportation with minimal frills, the Chevy Tahoe and Suburban pair cost a bit less than the duo's Yukon counterparts. 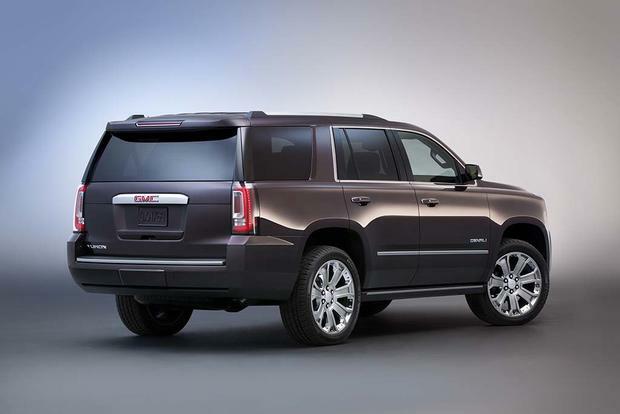 If you're looking for the ultimate in luxury, the Denali will save you some money over a comparably equipped Escalade.